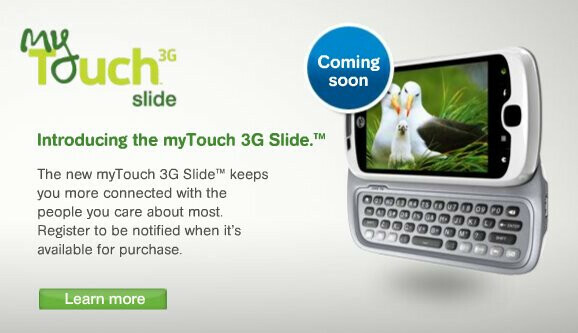 Hailed by some as being the successor to the original Android handset that spawned the Android army, the T-Mobile myTouch 3G Slide has been officially announced. We've seen plenty of shots with this upcoming device, but now we can say for sure that this thing is looking to greet T-Mobile's lineup with a decent offering. Some of its key features include a 3.4” HVGA touchscreen, Android 2.1, QWERTY keyboard, 5-megapixel auto-focusing camera with flash, 8GB microSD card, and preloaded with the Swype keyboard to supplement its physical one. In addition, the Genius Button will be on board which enables voice command features that are powered by Dragon Dictation from Nuance Communication. Not only can you make simple phone calls with your voice, but you can even compose messages, emails, and surf the web with it. Those who are really digging this device can sign up on T-Mobile's web site to get the latest information regarding the smartphone – but it's worth noting that it is expected to land some time in June. Now only does it make its entrance during the perfect summer month of June, but it'll surely slide right on in and get comfy with some of the competition thanks to the variety of colors it'll be showing off – which include red, black, and white. 3.4" with HVGA resolution and puny 600 MHz cpu are bummers :( However, the Genesis Button seems to be a very nice feature and driving friendly too. This phone better be under $100... but my guess is $149 with 2 years contract. Based off the Slide ROM that you can flash on G1s and regular myTouches right now, the phone should be plenty fast for the average consumer.